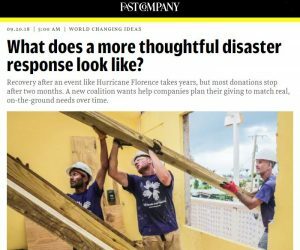 20 Sep Fast Company – What does a more thoughtful disaster response look like? On September 14, Hurricane Florence made landfall in the Carolinas. Days after, flood waters continue to rise. Thousands of homes–over 4,300 in Bern, North Carolina alone–have sustained damage, and the full effects of the hurricane are not yet known. But the pattern of response to Florence will be more predictable. Already, corporate donors are pledging commitments to aid affected areas, and fundraisers for organizations like Habitat for Humanity, the American Red Cross, and GlobalGiving are underway. Read the rest of the article here to learn how Good360, All Hands & Hearts – Smart Response and Global Citizen are contributing to a more thoughtful response in disaster recovery.